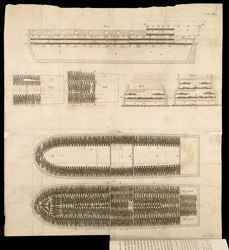 Plan of the slave ship Brookes, from Thomas Clarkson's "The history of the rise, progress, and accomplishment of the abolition of the African slave trade by the British Parliament". bl.uk > Online Gallery Home	> Online exhibitions	> Caribbean Views: the full collection	> Plan of the slave ship Brookes, from Thomas Clarkson's "The history of the rise, progress, and accomplishment of the abolition of the African slave trade by the British Parliament". This is probably the most famous image produced by the abolitionist campaigners. It shows exactly how enslaved Africans were carried on the slave ship 'Brookes'. Four hundred and eighty-two captives are shown here; the true number carried could, in fact, be even higher. Many practices relating to the slave trade were little known in Britain in the era before mass communications. The Society for Effecting the Abolition of the Slave Trade researched and publicised this information in radical new ways. The Brookes plan was widely circulated in the press, making 'an instantaneous impression of horror upon all who saw it'.